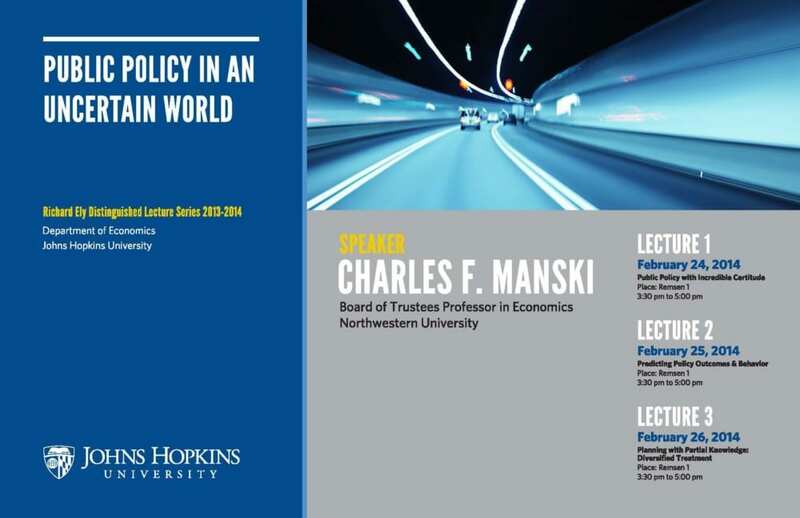 Charles F. Manski has been Board of Trustees Professor in Economics at Northwestern University since 1997. He previously was a faculty member at the University of Wisconsin-Madison (1983-98), the Hebrew University of Jerusalem (1979-83), and Carnegie Mellon University (1973-80). He received his BS and PhD in economics from MIT. in 1970 and 1973. Manski’s research spans econometrics, judgment and decision, and the analysis of social policy. His work has been instrumental in advocating for and developing methods to use subjective expectations data in structural econometric models. He is author of Public Policy in an Uncertain World (Harvard 2013), Identification for Prediction and Decision (Harvard 2007), Social Choice with Partial Knowledge of Treatment Response (Princeton 2005), Partial Identification of Probability Distributions (Springer, 2003), Identification Problems in the Social Sciences (Harvard 1995), and Analog Estimation Methods in Econometrics (Chapman & Hall, 1988), co-author of College Choice in America (Harvard 1983), and co-editor of Evaluating Welfare and Training Programs (Harvard 1992) and Structural Analysis of Discrete Data with Econometric Applications (MIT 1981). Manski has also served as director of the Institute for Research on Poverty (1988-91) and as chair of the Board of Overseers of the Panel Study of Income Dynamics (1994-98). Editorial service includes terms as editor of the Journal of Human Resources (1991-94), co-editor of the Econometric Society Monograph Series (1983-88), member of the Editorial Board of the Annual Review of Economics (from 2007), and associate editor of the Annals of Applied Statistics (2006-10), Econometrica, (1980-88), Journal of Economic Perspectives (1986-89), Journal of the American Statistical Association (1983-85, 2002-04), and Transportation Science (1978-84). Service at the National Research Council includes being chair of the Committee on Data and Research for Policy on Illegal Drugs (1998-2001) and a member of the Report Review Committee (from 2010), the Committee on Law and Justice (from 2009), the Board on Mathematical Sciences and their Applications (2004-2007), the Committee on National Statistics (1996-2000), and the Commission on Behavioral and Social Sciences and Education (1992-98). Manski is an elected member of the National Academy of Sciences, and an elected fellow of the Econometric Society, the American Academy of Arts and Sciences, and the American Association for the Advancement of Science.